This spicy soup gets it's zesty flavor from green chilies and red curry paste. But don't let the spicy ingredients scare you, adjust the seasonings down just a bit for a milder flavor. Also, if you would like to make this soup a whole meal, add a can of black beans. See note below. Heat the olive oil in a heavy soup pot over medium-low heat and add the garlic, cumin and curry paste; stir for one minute. Add the pumpkin, tomatoes with green chiles, roasted corn, and salsa. Stir to combine. Add the broth. Heat through to a simmer, and begin adding the coconut milk; start with one cup. If you like it creamy, add more. Season with sea salt and ground pepper, and cilantro. Heat through gently and bring to a slow simmer. Taste test and add the fresh lime juice to brighten the flavor. Stir. Add more spice if you need more heat; add more agave (or maple syrup if substituting) and/or coconut milk if you need less heat. 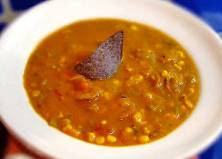 Serve with organic blue corn tortilla chips. Makes four servings. ** Optional: Add a can of rinsed and drained black beans for more protein.